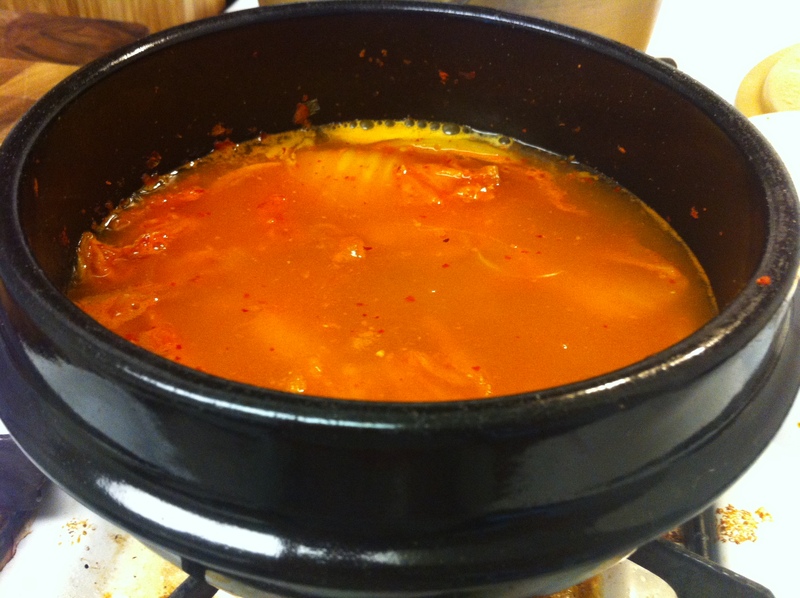 Kimchi-jjigae (김치찌개) is one of those soups that can be made with anything from bacon, canned tuna and myulchi broth. Today I will show you how I made kimchi-jjigae with sagol-guk (사골국), a bone marrow broth I made a few days ago. My family and I had a fabulously rich French cuisine for lunch to celebrate my husband’s first vacation in a year. It was a wonderful experience but afterwards, all I wanted to eat was kimchi–jjigae for dinner, a very typical Korean response. This kimchi–jjigae was actually one of the easiest stews I’ve made in a long time. All I had to do was to take out the sagol-guk from the freezer and defrost, sauté some kimchi and cook it with some vegetables and tofu. The total prep time took less than 10 minutes and I was able walk away when the jjigae was stewing for about 20-30 minutes. The best part was that it was one of the most delicious kimchi-jjigaes I’ve ever made. Heat a tablespoon of sesame oil in a small pot or medium size ttuckbaegi (뚝배기, Korean earthenware pot) on medium heat. 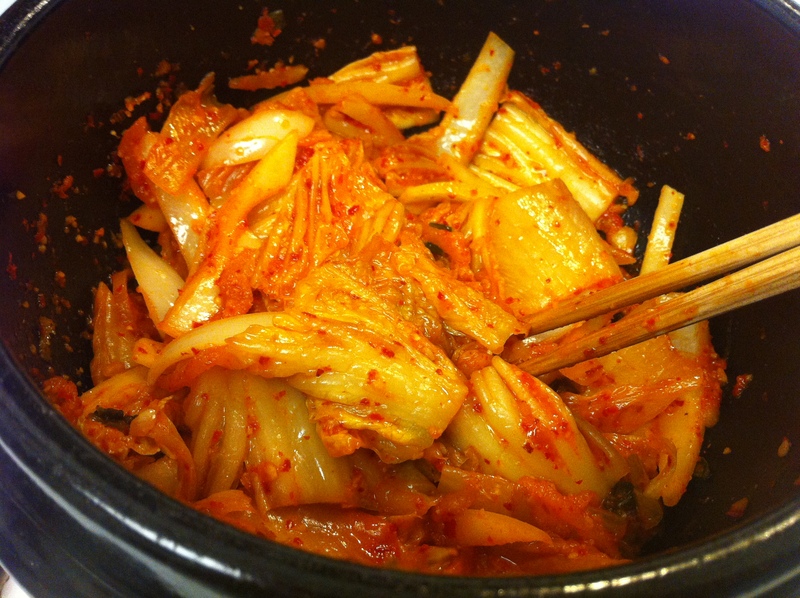 Sauté the kimchi, onion and garlic for about 5 minutes they are until tender. Pour in sagol–guk (사골국) and kimchi juice. Increase the heat to high and bring it to a boil then lower it to a simmer. Cook for at least 20 minutes. Increase the heat once more and add the tofu and scallions. Stew for another 5 minutes. 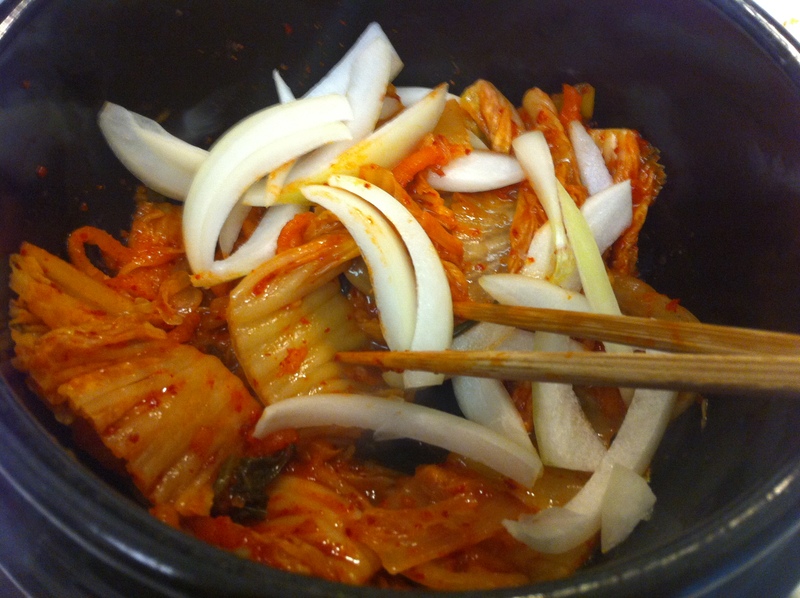 Taste the kimchi­-jjigae and season with gukganjang (국간장, Korean soy sauce) or regular soy sauce. You can add a little gochugaru (고추가루, Korean red pepper powder) to make it extra spicy. 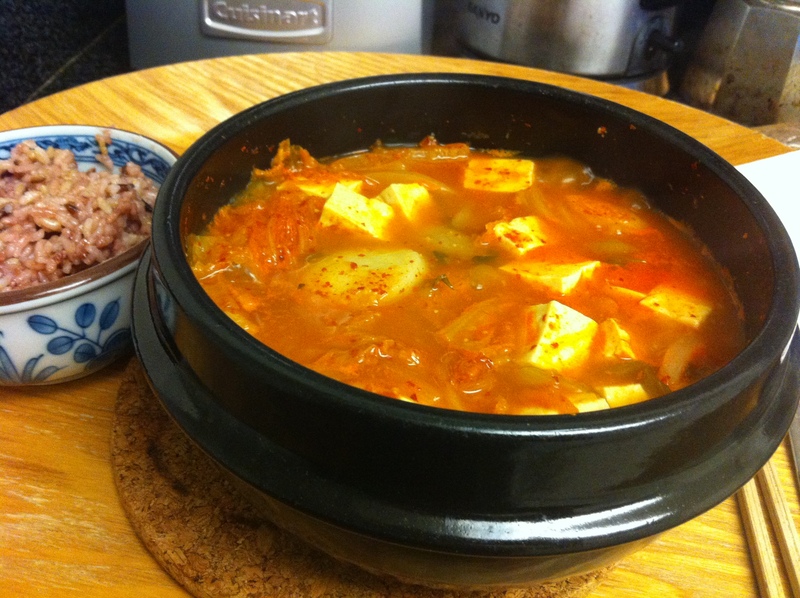 Always use aged kimchi for kimchi-jjigae. 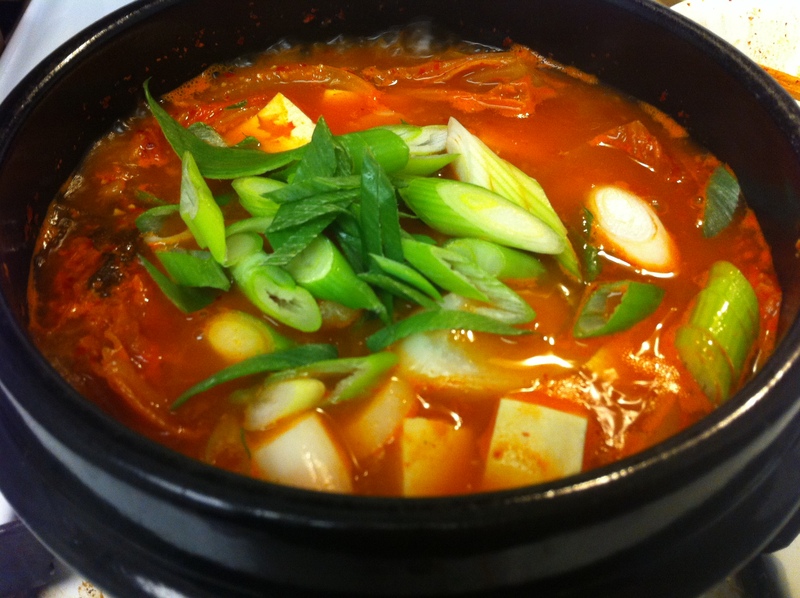 Kimchi becomes sour as it ages and this is the best kind to make kimchi-jjigae. If you can get a hold of mooguenji (묵은지), which is an well-aged kimchi made specifically to be eaten after an aging process, use it instead of regular kimchi. If your kimchi is very sour, you may want to add a little sugar to balance the sourness although I generally do not use sugar in mine. 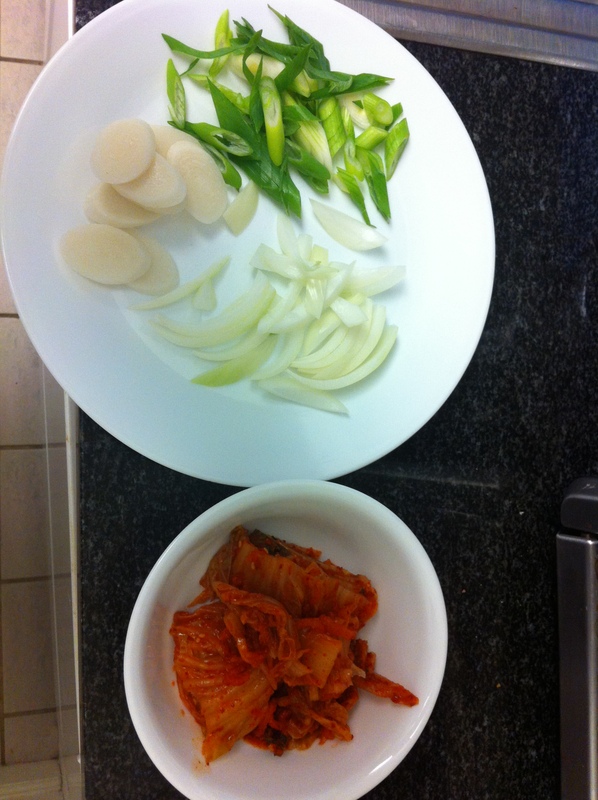 You may want to add more onions instead because the onion sweetens the kimchi-jjigae as it cooks. You can also add ttuck (떡, rice cakes) or even mandoo (만두, dumplings) in the kimchi-jjigae towards the end of the cooking process. This entry was posted in Good for dinner, Good for lunch, Soup/Stew (국/탕/찌게) and tagged Bone Marrow, Jjigae, Kimchi, Sagol-guk by gangnamkitchen. Bookmark the permalink.